In 1934, the Austrian philosopher, Ludwig Wittgenstein, spent a summer in the cottage of his friend Con Drury in Rosroe, at the very edge of Ireland’s only true fjord: Killary Bay, in Connemara. He returned there towards the end of his life, completing much of his posthumously published Philosophical Investigations, while living a solitary life in the tiny cottage at the edge of Europe. 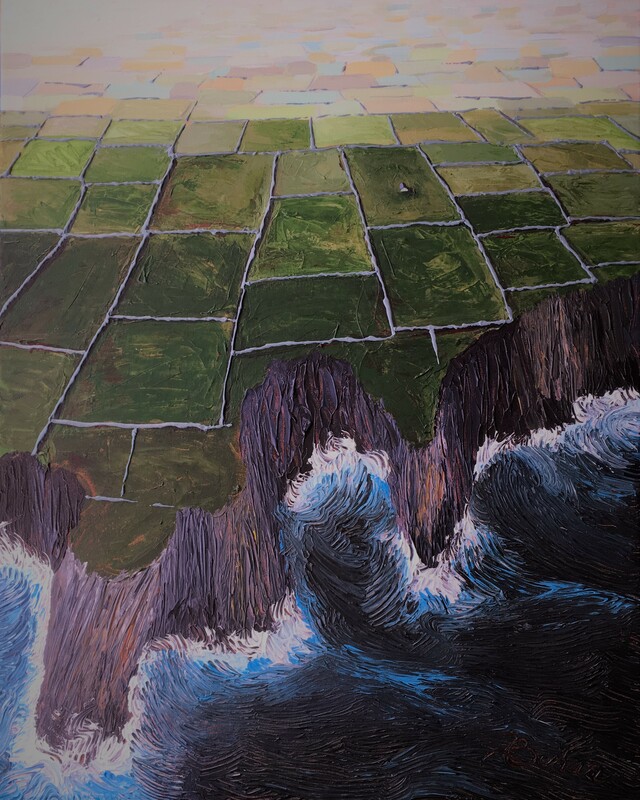 Inspired by the great Austrian philosopher and sharing his appreciation for the landscape of Connemara, Derek Behan and a fellow artist, Declan Marry, made a number of pilgrimages to this part of Ireland and created a series of paintings arising from this experience. Tapping into aspects of Wittgenstein’s philosophy, these works seek to engage with the landscape free of preconceptions. 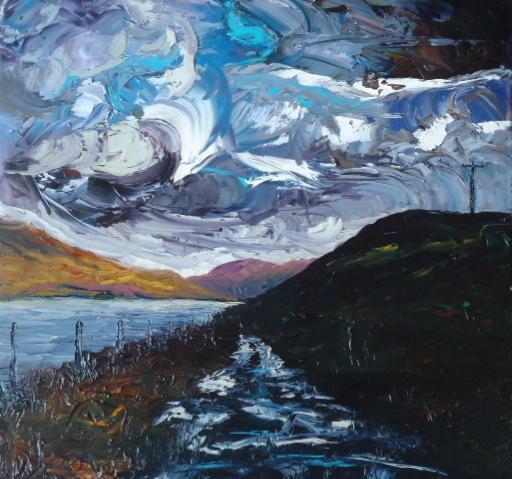 In this painting, freshly observed, the paths that lead from Rosroe to Leenane are no longer seen as mere paths or tracks. They are appreciated as particular features of the Connemara landscape which are renamed ‘stream-paths’: they are neither true paths or true streams but unique thoroughfares comprised of equal parts of both concepts. The landscape of Connemara is one of drama and change. Huge mountains appear before your eyes like statements of permanence. Minutes later, however, these seemingly indomitable peaks are rendered invisible by the latest wave of vapour rolling in off the Atlantic. 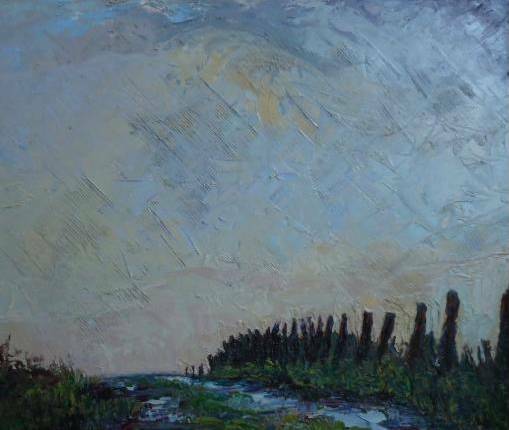 This painting captures the power of that vapour as it imposes itself on this dynamic landscape. 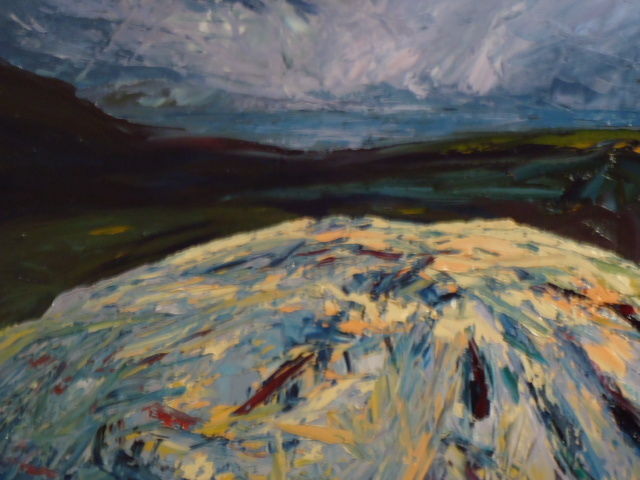 In this painting, the artist takes our eyes on a journey across the hills of Salrock in Connemara, where huge monoliths are revealed like the very the bones of the landscape. Painted in heavy impasto, the beautiful colours of the lichens and minerals in the rocks’ seams are revealed. The vigorous palette knife rendering of lines and grooves in the stone illustrate the artist’s appreciation of the secret geological dynamism of this land. 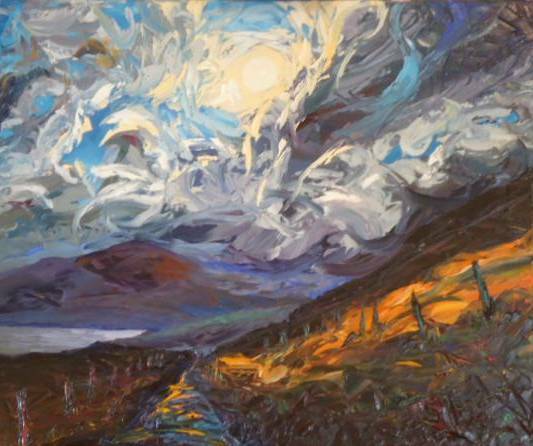 This painting captures the extraordinary dynamism of the Atlantic skies and their lighting effects. Conscious of Wittgenstein’s reflections on visual ambiguities, the artist renders a landscape where, in an instant, a rain-sodden heath is transformed to a flaming ribbon of light. For a concise account of Wittgenstein’s association with Ireland, read Wittgenstein in Ireland by Richard Wall.